2 Pieces Included: Pearl Rhinestone Feather Fascinator Hair Clip Headpiece, Approximately 5 x 5 inches with longer feather sprays. Back of Fascinator has a slide in hair clip. 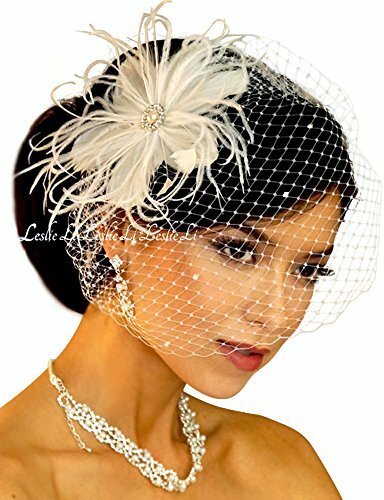 Bridal Birdcage Veil approximately 8 inches top to bottom, 12 inches wide, comb attachment. Design and Style by Leslie Li - Love your Look! Styling and storing videos included. 2 Pieces Included: Pearl Rhinestone Feather Fascinator Hair Clip Headpiece. Back of Fascinator has a slide in hair clip. French netting attached to a metal comb. If you have any questions about this product by Leslie Li, contact us by completing and submitting the form below. If you are looking for a specif part number, please include it with your message.